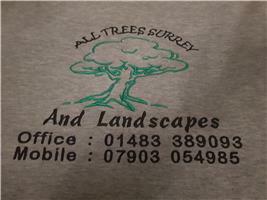 All Trees Surrey & Landscapes - Fencing/Gates, Landscaper based in Woking, Surrey. All Trees Surrey & Landscapes are a family run business with over 35 years of experience in the tree surgery industry and landscaping. We are based in old woking surrey. Our team leader kiron Floyd has N.P.T.C certificate. All our team members are from merrist wood collage and are highly experienced. All Trees Surrey & Landscapes offer a affordable service and competitive quotations. If you would like any more info please google All Trees Surrey and Landscapes. All Trees Surrey & Landscapes services are.